I had a sudden urge to blog today and so I took my daughter to lunch at France's only food court. 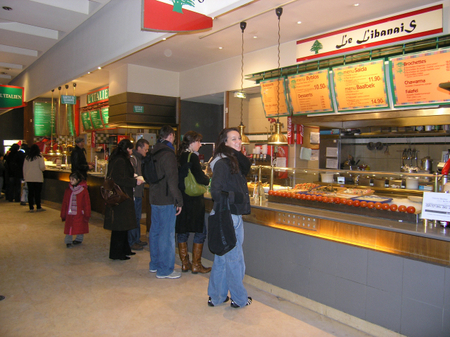 It is located in the Caroussel du Louvre (the little shopping mall under the pyramid). The entrance is practical too if you want to go to the museum, when there is a huge line in front of the pyramid you can go through the carrousel and save some time. I used to go there a lot when I got homesick because it reminded me of the mall and it's family friendly too. Here is my beautiful daughter waiting in line for some Lebanese food (and as you can see there is an Italian place just behind for pizza). Please all cross your fingers for her because she has an interview tomorrow for a summer job at Yellowstone! 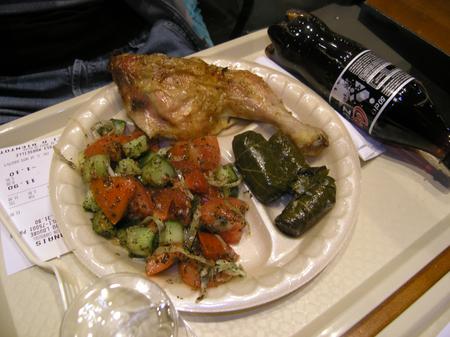 And here is her 11.90 euros lunch consisting of chicken, stuffed grapeleaves, tomato and cucumber salad with mint, and a coca zero (this is the manly version of coca light which they happened to be out of). 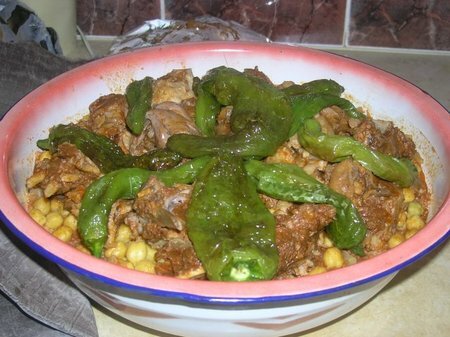 I had a lamb tagine and a diet coke for 14.00 euros. The semoule was actually pretty good but then I forgot to take a picture of the food stand. It is called Marrakech something and has a palm tree on the sign. I did however (completely accidentally) get a photo of this romantic couple. In the background you can see the famous Universal Burger and a place called Douce France where they sell French specialities. We got crepes for desert. 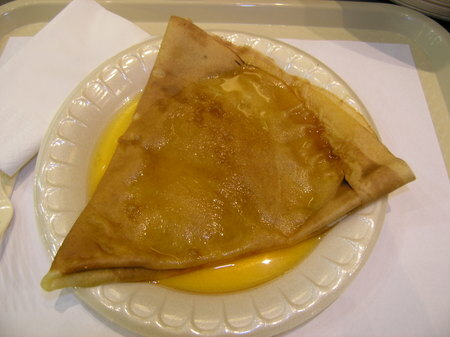 Mine was supposed to be a crepes suzette...where's the strawberry? 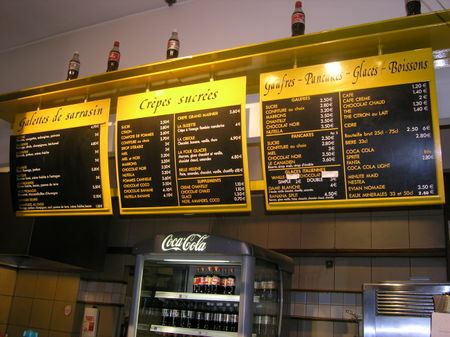 Many crepes to choose from. 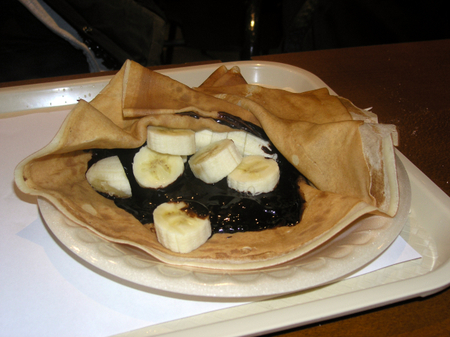 My daughter more wisely chose the chocolate and banana crepe. You can have whipped cream as an extra for 1.10 euro. 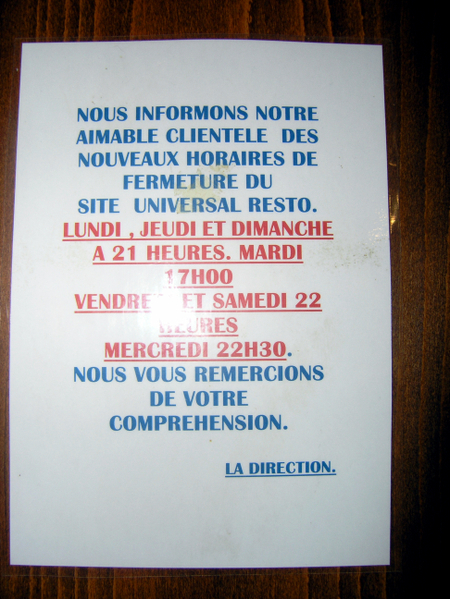 Please note that the opening hours on the site are incorrect (it is not open until 11 pm any more). The new hours are confusing so I took a photo. On Mondays, Thursdays and Sundays they close at 9 pm. On Tuesdays they close at 5 pm. On Fridays and Saturdays they close at 10 pm and on Wednesdays they close at 10:30 pm. Aside from the stuff you can see available in the photos there are Chinese, Sushi, Roast Chicken, Salad, and Spanish places too. The food is just ok but it's convenient, and good for people with picky kids. 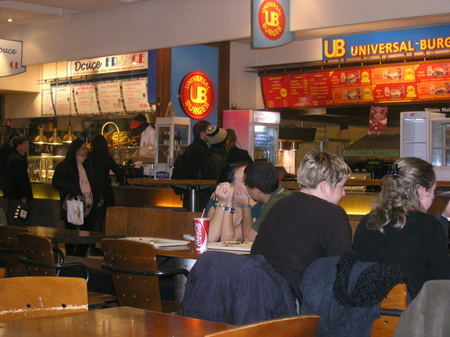 And, of course, it's the only food court in France. I also have some very exciting news. After two years without an adventure I've reserved a Paris/Mumbai for August 2008. I'm finally going to go to India! where I will try to take many fabulous food photos. Hopefully I will blog again before then but if not please make sure to come back in September for my lowdown on Mumbai street food. 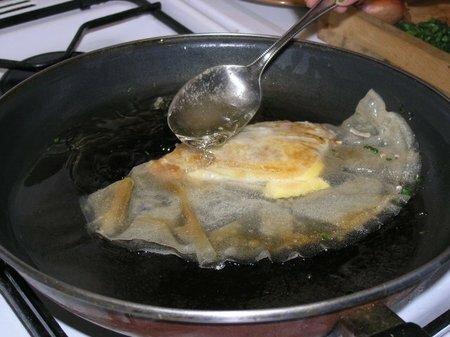 Last weekend I made a lovely Tunisian speciality, brik à l'oeuf. I hesitated before posting this entry because I was not really thrilled with the results. But, since Ramadan is just around the corner and I probably won't be making these again for a while, here goes. 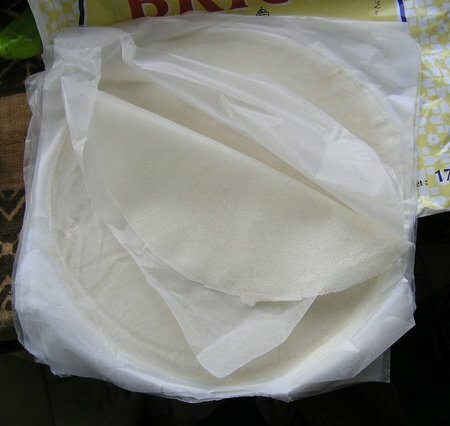 Here are the briks. 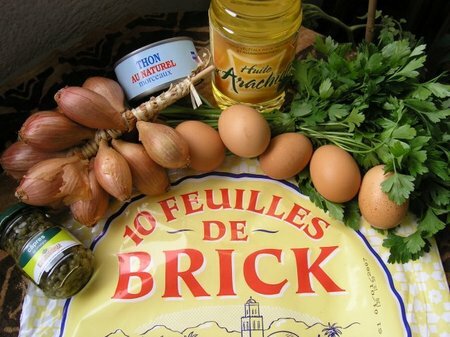 And so what is a brik? 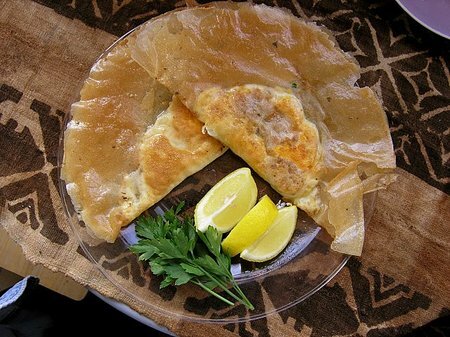 Check out this link www.ochef.com. 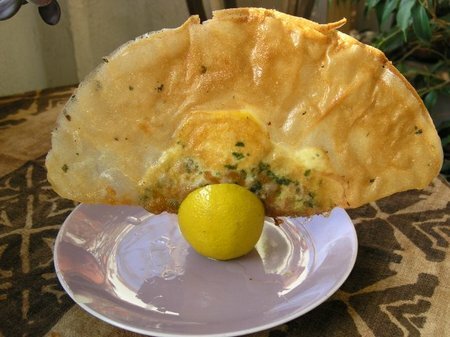 I can buy brik in the supermarket in Paris, you may have to substitute phyllo dough or Chinese spring roll skins...you get the idea. 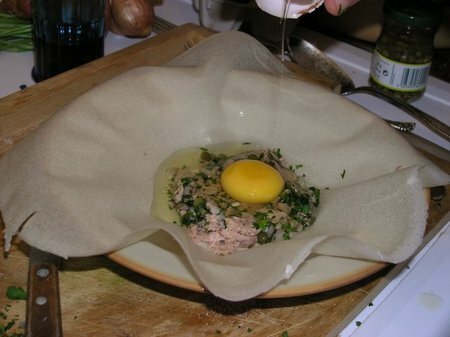 Tuna, chopped parsley, minced shallots, and capers as well as the egg. This is what it will look like in the end. A lovely golden brown color. They look like this when they are raw and in French they are called "corne de boeuf": beef horn. 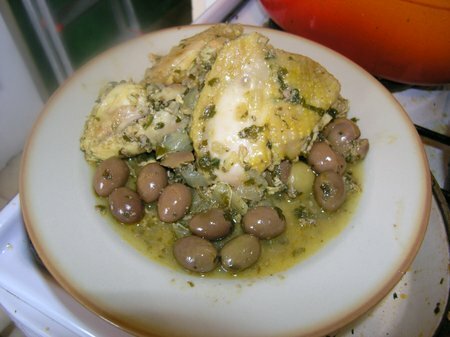 Important: please make sure to read Part I of this post for the full chicken with lemon and olives experience, thanks. 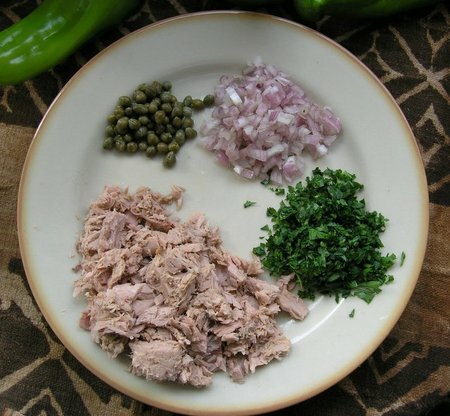 Clockwise from upper left, grated onion, the marinated chicken, olives, chopped parsley and coriander and fresh and preserved lemons. 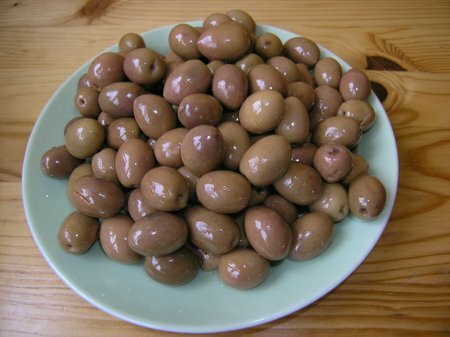 The olives are just so perfect, and now let's get down to cooking. 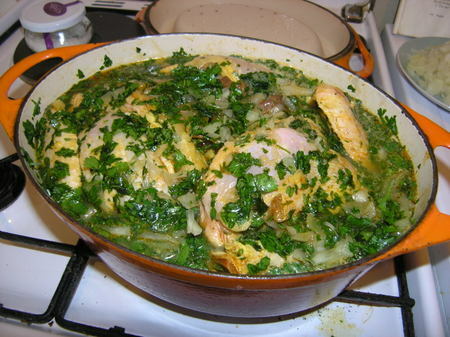 Getting started, the stove top is clean, the marinated chicken in the cassorole (which is way too small) with some of the grated onion and the parsley and coriander. Ok, so we bring to a boil and cover, and wait...30 minutes. This kind of slow cooking is always better when you have helpers. Here is my daughter hanging out by the stove, testing and giving advice...while I reduce the sauce...this is an ideal cooking situation. 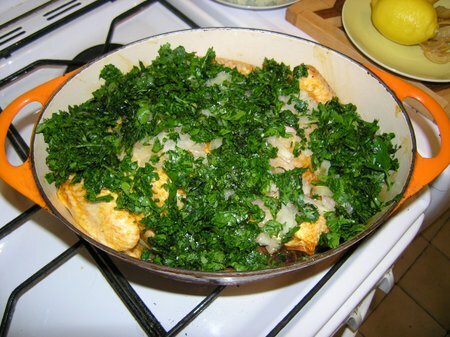 The chicken has been placed in the serving platter, and the reduced sauce is going on top, adding the fresh lemon juice at the end is the key to a successful sauce. 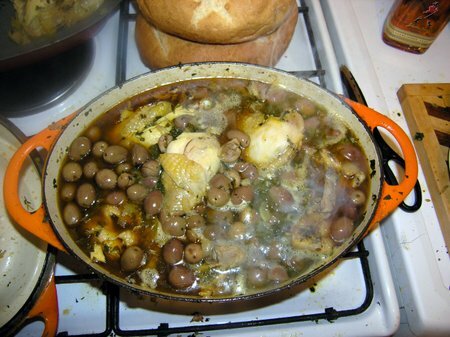 And whoops, the photo shows that my equipment is perhaps not so up to date, be assured, I didn't burn the sauce, that old black circle is from once long ago popcorn making...real people don't go out and buy new casseroles when they do recipes and anyway, I like this casserole, I've been using it for 20 years now. 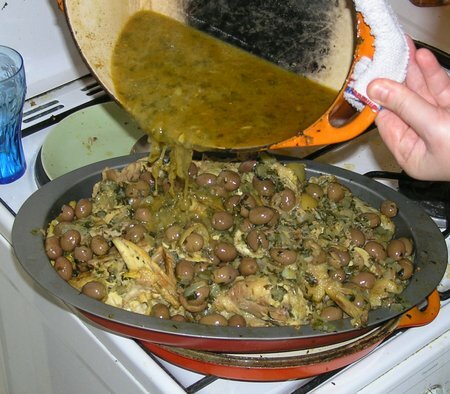 As promised, here is the first installment of "Chicken with Lemon and Olives". 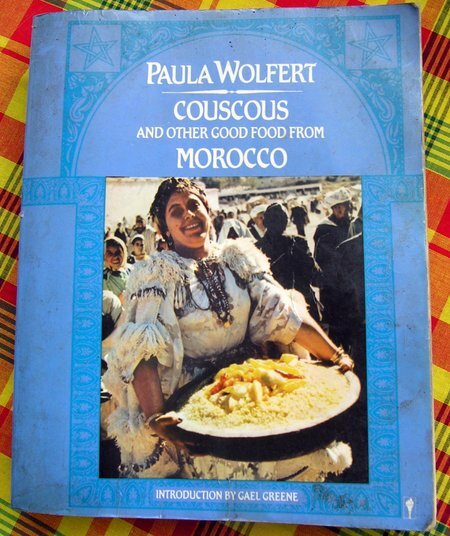 Here is my much loved, much used and oft spilled upon copy of Paula Wolfert's wonderful book. You can get your own copy here and at 12.35 USD, it's a bargain. 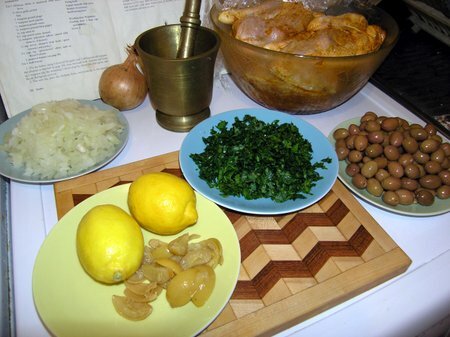 The recipe for Djej Emshmel (Chicken with Lemon and Olives) is posted over at epicurious (link to the recipe and also some instructions for preserved lemons). 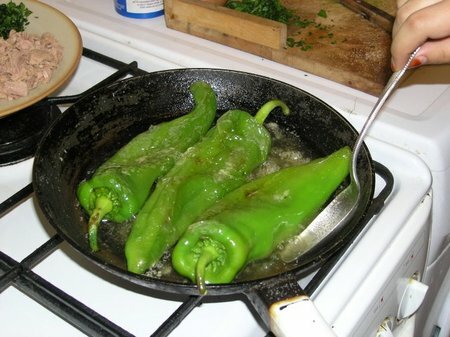 I'm not sure if I'm allowed to post the recipe here so I'll just let you go the the link and you can print from there if you want to try this yourself. 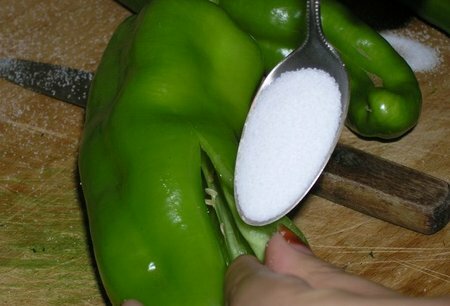 It's exactly the same as the recipe in the book. My shopping mission was successful and here are all my ingredients. 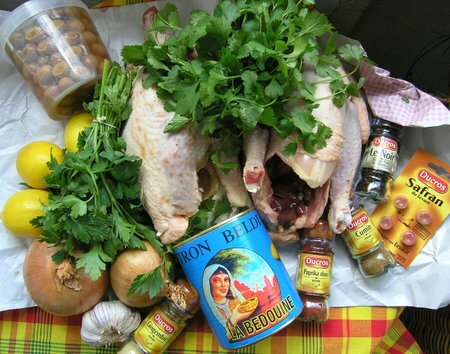 I got my two chickens from the Moslem butcher shop and they are free range hallal chickens...so authentic. 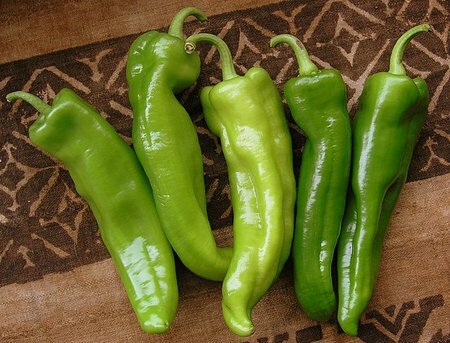 If you can't get hallal perhaps you could try kosher but in any case you should make sure they are free range. 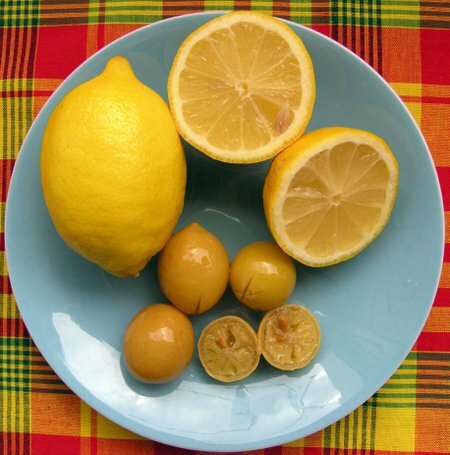 The picture is not great because it was getting late and I was losing the light but I think it should still be obvious that the fresh lemons (on the top) and the preserved lemons (on the bottom) are not the same. And in the case where you can't find these near where you live you can order online so now you have no excuse not to try them. 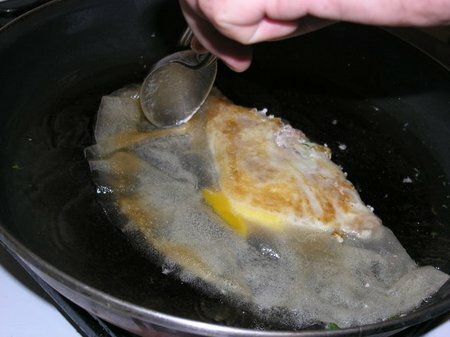 This dish has to be marinated over night (hence the installments). 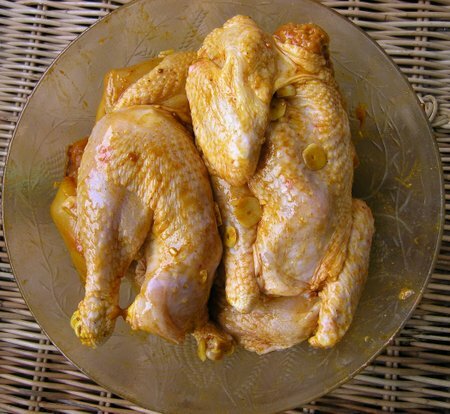 Here is the chicken before it went into the fridge in it's marinade of salad oil, saffron, ground ginger, paprika, cumin, salt, black pepper, and thinly sliced garlic. 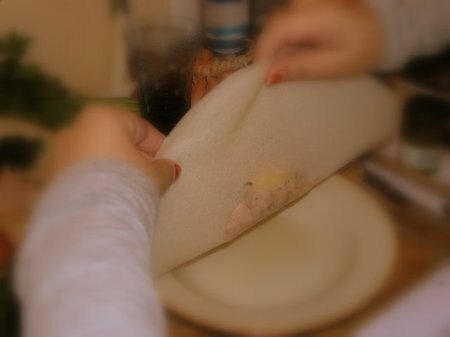 I was pretty disappointed with my last couscous lunch and so I decided to go to Les Doigts de Fée (fairy fingers to be exact but also a metaphor for nimble fingers used to describe someone who is really good at handicrafts or gives good massages or whatever). Anyway, Les Doigts de Fée is located 78, rue Miromesnil in the 8th and they have a website (only in French unfortunately) where you should make sure to check out the video with the really cool and exotic Arabic music. Today's lunch cost 11,90 euros and included the couscous with one piece of chicken, one merguez (a North African sausage), broth with vegetables, a dessert, a beverage, and some excellent mint tea. Compare this with the 15,50 I spent for just a bowl of couscous and nothing else in the trendy overpriced place with the square plates...hmmm. Here is a close up of the semoule (the couscous grains)...nice and light and fluffy. And I'm also going to give Les Doigts de Fée my vote for the most luxurious plastic flatware in Paris. Nice and sturdy with an absorbant napkin and attractive packaging. I think little things like this count too in the ultimate lunch experience. The dessert: a delightful little cake made with almond paste and orange essence. 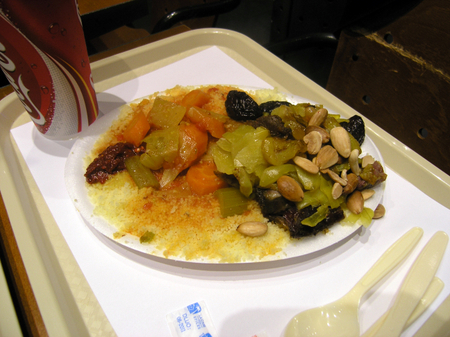 The final photo: the couscous with the vegetables and the meat served in a lovely foil tin (yeah I could've gone to the kitchen and gotten a plate but what's the fun of that). This was just good authentic couscous.